We’re taking a week off from our motorhome and spending it in a real house. We rented a holiday cottage in rural Angus for our annual ‘Pals’ Holiday’. Most years we spend a week with our good pals, Derek and Mary, to enjoy a bit of chill out time together. 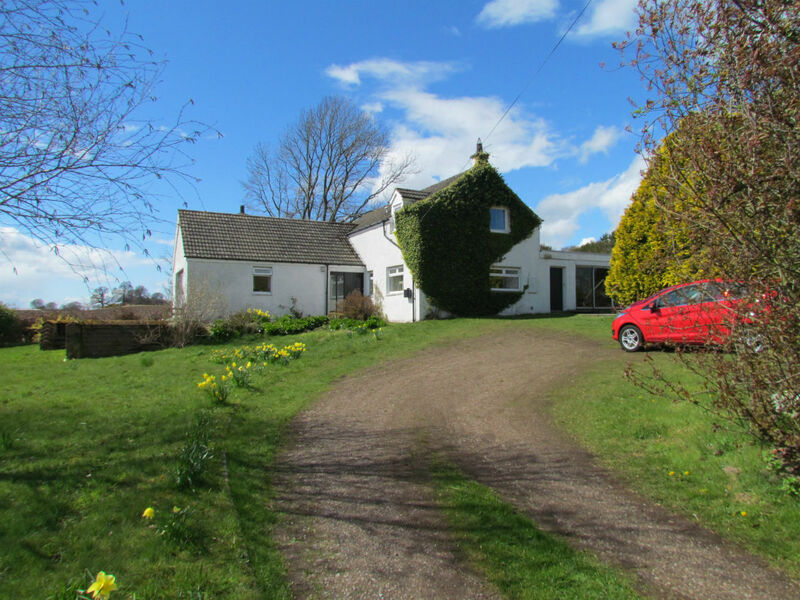 The house is an old farmhouse that has been altered over the years to include a big lounge with a full wall of windows looking out over the Perthshire hills and a massive games room at the back of the house complete with darts board, table tennis table, a croquet set and boules. Everything about the house is big – the kitchen diner, the lounge, the range cooker and the stag’s head on the wall halfway up the stairs. Adjusting to life in a big space is disconcerting after almost seven weeks on the road. Going to put the kettle on and make a cup of tea involves a trek of about five times the length of the motorhome and there’ve been moments when we’ve lost one another in the cavernous space. I did wonder, before we came here, whether spending time in a house would make us feel a bit homesick for our own place. So far it hasn’t had that effect at all. Sitting here in a big leather sofa, looking out over the hills I’m reflecting on what it means to have an extended period of time to just wander and see what’s out there. A few months ago, I was reading on a motorhome forum about a couple who sold their house and set off in their motorhome to find where they would like to settle. Nine years later they’re still travelling. The only reason they haven’t stopped is that they’re having such a good time. Right now I can understand that. There’s something appealing about a lot of places, yet every one of them has its drawbacks. This area is absolutely beautiful and the big old house is comfortable and reassuringly solid. If we lived here we would no doubt get fed up of having to drive 6 miles to the nearest pub or shop and the house would demand a lot of loving care, not to mention expense. When we see a beautiful place we remind ourselves that we can visit it in the motorhome – we don’t need to own it. Something unexpected about this wee break is the discovery that walking dogs in rural places is not as easy as you might imagine. There are very few safe, relatively enclosed areas around, as most is either farmland or wild glens. Poppy is not to be trusted where there is a scent of wildlife and at the moment the March hares are out in force – they don’t seem to realise it’s May. The fields around the house are alive with them on their crazy search for love or roe deer hopping lightly over fences, tossing their white tails at a mesmerised Poppy who is desperate to chase them. She has to be on the lead, which means we have to walk a lot further to tire her out. Our solution has been to take them to Forfar where you can walk the full perimeter of Forfar Loch and to Arbroath where you can walk for miles along the cliffs looking out over the sea. As we strode along the cliffs in the sunshine, feeling the cold bracing air on our backs, pushing us gently along, we were slow to notice a brooding presence behind us. When we finally stopped to admire the panorama we saw the unmistakeable sight of rain pushing up the coast. We walked a little further before deciding to turn around in an attempt to get back to the car before it reached us. We managed about twenty steps before the weather hit – but it turned out not to be rain at all. Vicious hailstones pelted us as we walked into the teeth of the wind. By the time we got back to the car we were soaked right through to the knickers. Even Poppy was quiet as she trudged along, dripping from her ears to her tail. Driving out of the car park, all of us smelling like wet dogs, we were astonished to see the storm blowing on beyond us and the sun coming out again as though nothing had happened. Very nice to SEE everyone. We actually bought one of these units, so will be in and out next year. You (all) are invited! Great photos. Did you take them on self-timer or is Derek nifty with a camera?